Pisang Peak Climbing 19 days trek is a moderate trek. Travelers who can walk up to 6-7 hours a day on an uphill and downhill trail will find this trek fulfilling. It is best that we prepare ourselves for the Annapurna trek by jogging and exercising regularly at least a month prior to the start of the trek. Trekking to the Everest Base Camp should be relatively easier for those who have experience walking/trekking in a high altitude environment. Past hiking experience would be an asset but no technical skill is required for this trip. It is also important that we consult our doctor. Participants with pre-existing medical conditions such as heart, lung, and blood diseases should inform Discovery Mountai Trek before booking the trek. The best time to trek to the Pisang Peak climbing is Spring (February to May) and Autumn (September to November). The temperature is moderate in these seasons and guarantees amazing views through the trip. Although this trek can be undertaken during winter, the cold temperature might not be suitable for everyone. This program from Discovery Mountain will take you to the summit of the most well-known peak in the Annapurna range, and also through Thorang-La Pass, a popular pass in Nepal. The topography and landscapes change dramatically – providing a unique experience of trekking combined with peak-climbing in Nepal. You will witness high-altitude yak-pastures, cross several glacial rivers, use a climbing rope, as in, a real mountaineering rope, also get to stay at the windy and ancient trading village of Jomsom, and visit the pilgrimage site of Muktinath. The trek begins from Besisahar, going into Lower Pisang, Upper Pisang, Pisang Base Camp, and then the High Camp. It also touches a section of the popular Annapurna Circuit Trek. Pisang is a Category-B peak with views of Annapurna I to IV, Gangapurna, Manaslu, and other peaks of the Annapurna Massif. It is also one of the busiest climbing peaks of Nepal. Discovery Mountain Treks recommends this program for amateurs and first-timers alike. This peak is best-climbed in the summer and in early autumn. It requires a good stamina, good physical shape and and a good habit of walking or exercise to scale this peak. 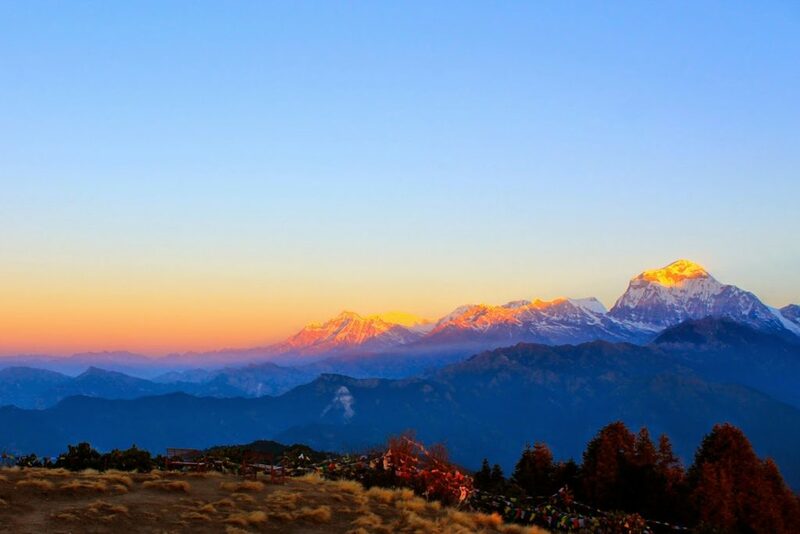 Book this program early and get ready for an exciting time in the Annapurna Region of Nepal. Upon your arrival in Kathmandu, our staff will pick you up and transfer you to the hotel. You can have the rest of the day to yourself. Later, you’ll be given a brief about the trip ahead. We begin by driving from Kathmandu via a scenic route to Mugling. After a brief stop there, take the route to Pokhara. Before arriving Pokhara, the road forks north to Besisahar. With a second stop at Besisahar, we take the route to Jagat. It’s a seven hour trek today. Starting after breakfast, we descend to the river and cross it. The terrain gets more and more beautiful as we head north until reaching Tal. At this point the giant peaks of Annapurna have already come into view. Take a rough trail from Tal, cross a dense forest to arrive at the village of Karte, and reach Dharapani in the Manang Valley where we will stay for the night. After breakfast, head along a forest and several ridges. The trail is rough today but the views are really great. Several high peaks of the Annapurna Range will be visible today. Take out your cameras and take some snaps, but pay attention to the trail as well. We will have plenty of stopovers, and the total walking duration is around five to six hours before we arrive at the village of Chame located at an altitude of 2,710 meters. Starting early, we will trek along a steep path. It’s lined by pine forests on either side. The landscape is dramatic, as we cross the rocks and suddenly arrive at a valley on the other side. The views from this point is nothing short of breathless. This is the road to Chame – with views of the mighty Himalayan peaks. Today we take a day of rest for the purpose of acclimatization and let our bodies adapt to the altitude. On this day, we take short hikes around, so that we can have excellent views of the mountains ahead. After breakfast, we head towards Pisang Peak Base Camp. The total walking duration today is around four to five hours, and we will be reaching an altitude of 4,350 meters. First we cross a forest, then a high-altitude yak-pasture, and look for a place to camp for the night. Leaving behind the Base Camp, we take a route from the south-west ridge – the most-frequented route to the High Camp. Along the way, you will be given ample training in using picks, axe, crampons, ropes, and ascenders. While the walking distance is just three hours today, we will utilize the rest of the in training and climbing to the High Camp. The team leader will make sure that you are confident and ready enough for the summit. Camp in the High Camp tonight at an altitude of 5,400 meters. On this exciting day, we will first ascend through the rope for about 20 meters (necessary only in case of thick snow). From there we climb on to a ridge and climb through some more rope some of which is fixed. Once at the 6,091 meter summit, the view is something beyond description – it’ll be like seeing the Annapurna mountain range for the first time. Relax and rest at the summit for a while, take some pictures and begin the descent to Pisang Peak Base Camp. Camp for the night at the Base Camp. Start early as we will be trekking around six to seven hours in high altitude today. We will be heading towards the beautiful and unspoiled Manang Valley at an altitude of 3,550 meters. Leaving behind Pisang Base Camp, we will pass through Upper Pisang with splendid views of Mt. Annapurna and other peaks in the range. Take some stops along the way and gradually arrive at the Valley of Manang for the night stay. After breakfast, leave Manang Village, cross a glacial stream and take the route coming out of the Marshyangdi Valley. From there our route turns north crossing a grassland, some juniper woods prior to arriving at Ghunsa hamlet. From Ghunsa, we cross yet another pasture, cross a river and come to an ancient mani wall. Have a brief stop here, take some pictures and trek a little further to arrive at the village of Yak Kharka at 4,110 meters. Stay overnight at Yak Kharka. Thorang Phedi is actually the base of the popular Thorang-La Pass. “Phedi” literally means “base”. After breakfast, we leave Yak Kharka and trek uphill, cross a river to Ledar village where we make a stop. Rest for some time, then trek trough cliffs and arrive at Thorang Phedi. Here we will be staying for the night. In the morning you will see how wonderful the views of the mountains are. Drinking your coffee or tea, you might want to identify the mountains one by one – but these are lesser known mountains with legends of their own. Pack your bags, for it’s a long day with nearly nine hours of walking. First, trek to Thorang-La Pass, one of the highest mountain passes in the world. Enjoy the feeling, take some photos, and move on. Next, we will be trekking to the Valley of Muktinath on the other side of the pass. It’s mostly a similar kind of terrain today once you head towards Muktinath, where you will stay for the night. Leaving behind the pilgrimage site of Muktinath, we head towards Jomsom immediately after breakfast. The windy village of Jomsom used to be a trading town when business was flourishing between Tibet and Nepal in the middle ages. Today, it is a quiet village at the foot of the mountains. Once here, you can visit the Ecological Museum frequented by trekkers. Enjoy your stay at Jomsom tonight in the vicinity of the mountains before heading back to Pokhara tomorrow. Catch an early-morning flight from Jomsom as later in the day flights are not operated due to high winds. It can get so windy in Jomsom that the locals have stories about flying boulders and sweeping stones! In Pokhara, you can enjoy the rest of day sipping beer by the lake or, if you feel like it, resting in the hotel room. In the evening though, do not miss the “Thakali” daal-bhaat in Pokhara.